The 15th April 2008 and new snow has fallen on the mountains of Skye....However, the sun is shining and we set off for our second full day of excavations at the rock shelter near Fiskavaig on Skye (for details and background information regarding this impressive site, see the previous entries in the ‘Latest News’ page. We continued with our excavations in Trench 1 today, investigating the upper section of the Iron Age midden associated with the last use of the rock shelter. After marking out the trench into 1 metres squares, we carefully removed the archaeological deposits. 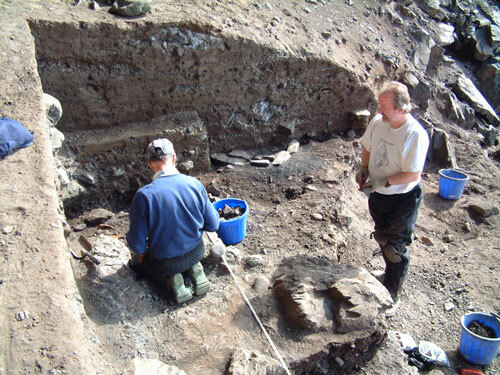 The image above shows the trench from the south with Martin and George at work....note the large boulders standing proud of the archaeological deposits. We found that the midden ran under these huge stones (boulders that had fallen from the roof of the rock shelter after abandonment) and we were fortunate that they tend to shatter easily, allowing us to remove them efficiently from the trench. 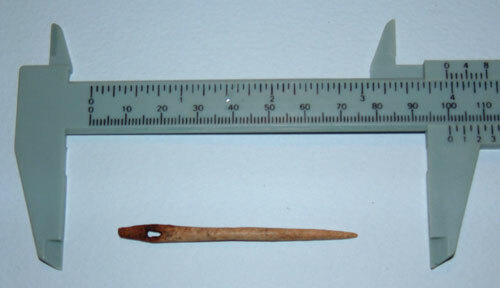 During the excavation of the shellfish and bone midden, George also recovered fire-cracked pebbles and a few nice small finds including a fine whetstone manufactured from sandstone, two conjoining fragments of ceramic crucible (heavily vitrified), a piece of worked bone, and a bone needle. Steven worked the area around the hearth setting that was uncovered yesterday. The hearth is slab-built and around it was fine ash and charcoal deposits. 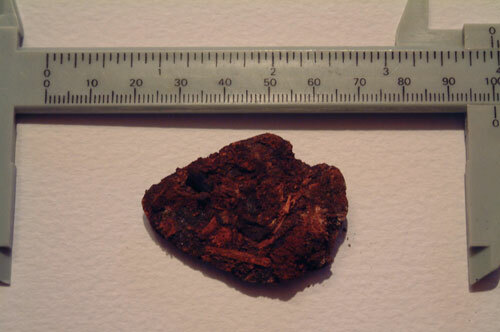 There was also fragments of animal bone including pig and cow, shellfish and a few fire-cracked pebbles. 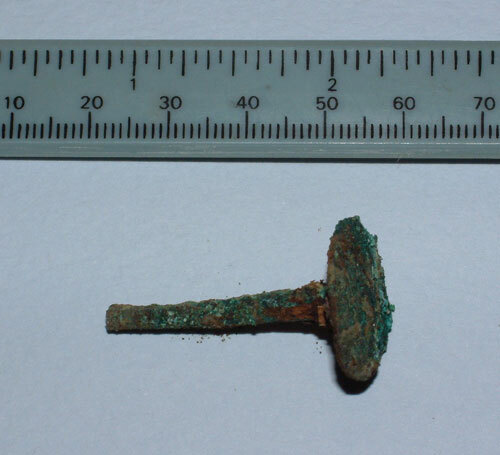 During the excavation in this area Steven recovered a fragment of worked bone, a large sherd of pottery, a small fragment of copper-alloy, a copper-alloy stud-type pin, and a small iron object that resembles an arrow-head. 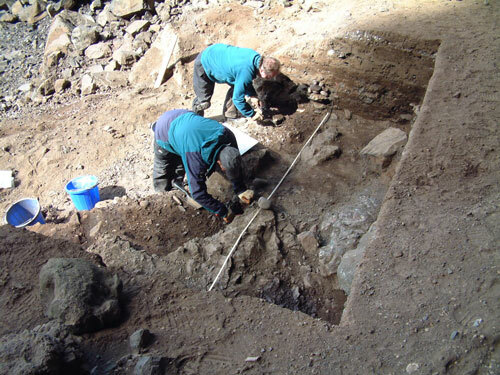 Martin worked in the area to the east of the hearth setting and initially had a difficult time removing the fragments of large boulder overlying the midden deposits. 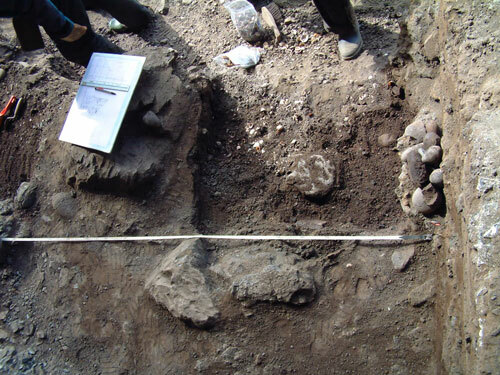 Eventually, he revealed a compacted and undulating area of archaeological deposits comprising a significant number of fire-cracked pebbles, charcoal deposits, some large pieces of animal bone including cow, and some shellfish remains. 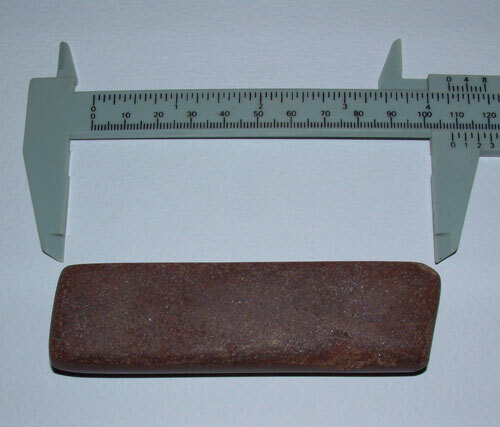 Martin recovered a pebble grinder tool (see image below) and over twenty sherds of pottery. The pottery, which most likely relates to the remains of one broken pot, has some decoration and a fine everted rim. 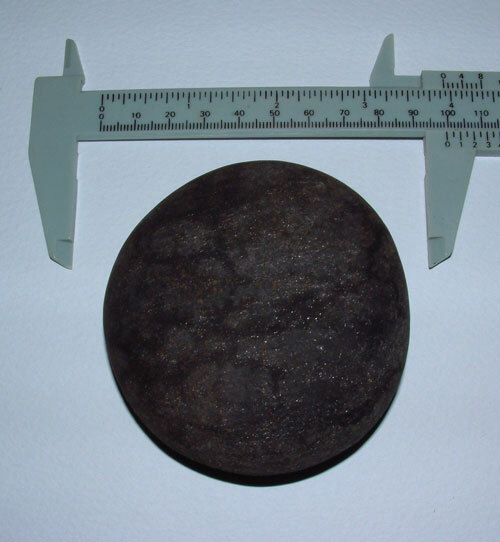 The pot appears to have been produced on a wheel, while the fabric is extremely well-fired. We also recovered an eroded find today from the beach immediately below the midden face. It is a small basalt boudler or cobble, into which a fairly deep hole has been gouged. 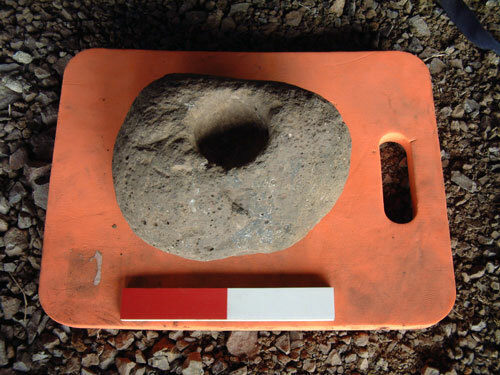 On the opposite face, there is a pecked area in the stone surrounded by a smoothed surface....possibly some form of anvil stone? (see the image below).